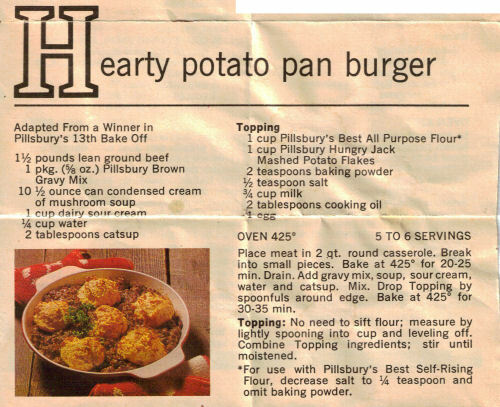 This recipe is from a Pillsbury Idea Recipes sheet and found in a large collection, date unknown. Recipe is typed below along with a scanned copy. Place meat in 2 qt. round casserole. Break into small pieces. Bake at 425° for 20-25 min. Drain. Add gravy mix, soup, sour cream, water and catsup. Mix. Drop Topping by spoonfuls around edge. Bake at 425° for 30-35 min. Topping: No need to sift flour; measure by lightly spooning into cup and leveling off. Combine Topping ingredients; stir until moistened. *For use with Pillsbury’s Best Self-Rising Flour, decrease salt to 1/4 teaspoon and omit baking powder. I have been looking for this recipe for years. We loved this when we were kids. I made this from the original recipe when I was a teenager. Thank you for posting it!